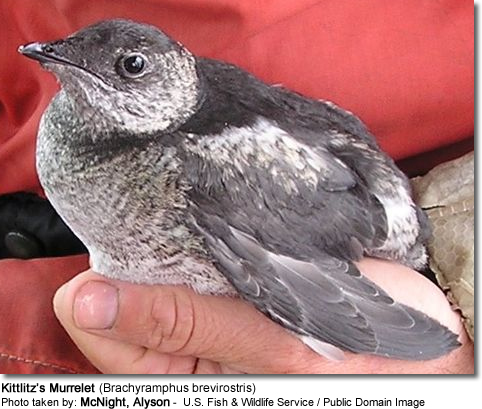 The Kittlitz's Murrelet (Brachyramphus brevirostris) is a small alcid found in the waters off Alaska and Eastern Siberia. This critically endangered species is, like the closely related Marbled Murrelet, unusual for seabirds in not being colonial, nesting instead in isolated locations on mountain tops, where the nests were known to Native Americans for many years before skeptical ornithologists described and photographed them. It is a poorly known and little studied species, although concern over its status and that of the closely related Marbled Murrelet has led to a recent increase in research. The Kittlitz's Murrelet is considered to be critically endangered by the World Conservation Union, although it is not listed under the Endangered Species Act (it was a Species of Conservation Concern until that category was abolished). It is threatened by habitat loss (as it is seemingly dependent on retreating glaciers), disturbance by boats and oil spills. An estimated 7-15% of the world population was killed during the Exxon Valdez oil spill (citation needed). Copyright: Wikipedia. This article is licensed under the GNU Free Documentation License. It uses material from Wikipedia.org... Additional information and photos added by Avianweb.